28 Addison Place is ideally located for access to all local amenities associated with a large town. Annan provides schooling, supermarkets & railway and bus stations. Carlisle and Dumfries are approximately a 30 minutes drive. The property is perfect for a growing family with three good sized bedrooms and the added bonus of a second reception room, ideal for dining /play room. There is also a Living room, Kitchen and Shower Room. The front garden is low maintenance and there is access to a communal, enclosed area (there is no upkeep liability for this area) and there are also two garden sheds. Coat hooks and tiled flooring. Windows with blinds. Two ceiling lights, storage cupboard, BT point, radiator and carpet flooring. Door to rear garden. Window to rear with blinds. One x three spotlights. Wall and base units, connection for gas cooker with cooker hood and extractor fan above. Plumbing for washing machine and space for fridge freezer. Stainless steel sink with drainer and mixer taps, tiled splashback. Pull down table, radiator and vinyl flooring. Window to side. Ceiling light and extractor fan. Sink, WC and walk in shower with electric shower. Radiator and vinyl flooring. Window, ceiling light, smoke alarm, loft access and carpet flooring. Windows to front and rear with curtain poles and blinds. Two ceiling lights and storage cupboards. BT and TV points. Radiator and carpet flooring. Window to rear with curtain pole and blinds. Ceiling light, range of fitted wardrobes. Radiator and carpet flooring. Window to side with curtain pole. Coving, ceiling light, carbon monoxide detector. Radiator and carpet flooring. The front garden is laid with chippings and pathway leading to the front door. There is an enclosed grassed area for use of the local residents in front of the crescent and no upkeep is required. The large, rear garden is laid with lawn, patio and drying green. There are two garden sheds and an outside tap. 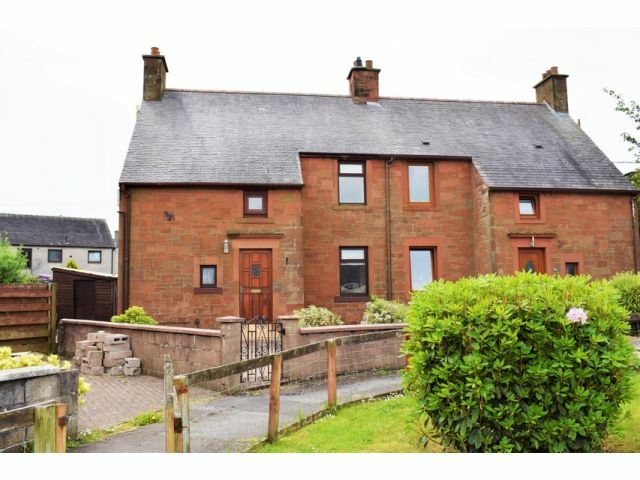 Offers in the region of £110,000 are invited and should be submitted to lj Residential, 93 High Street, Annan, DG12 6DJ or by fax to: 01461 205037.